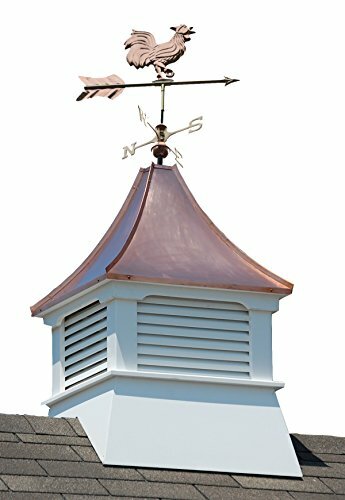 Good Directions Westport Vinyl Cupola with Copper Roof, 26" x 42"
For over 35 years, Good Directions cupolas have been the perfect complement to your home, garage, shed, barn, gazebo, pool house, carriage house, horse barn, or pavilion. Our expertly crafted, made to order, Coventry louvered cupola features roof molding and reinforced interior supports for added strength. It's made to order in the USA from durable, maintenance free Royal Brand PVC vinyl, constructed with precision using a CNC Router for accuracy and a lifetime of enjoyment. 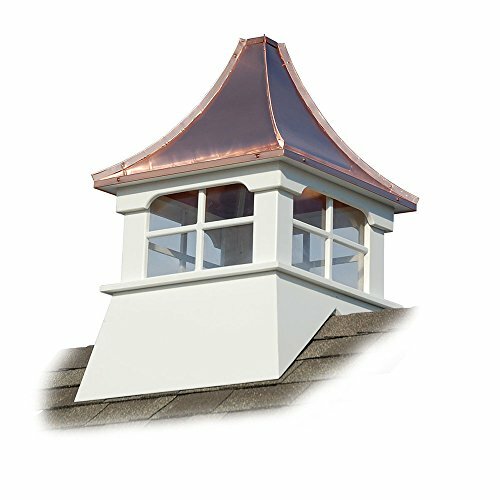 The Coventry features a 16 ounce, 24 gauge copper, pagoda style roof that adds an architectural element of beauty and lasting value to your home. 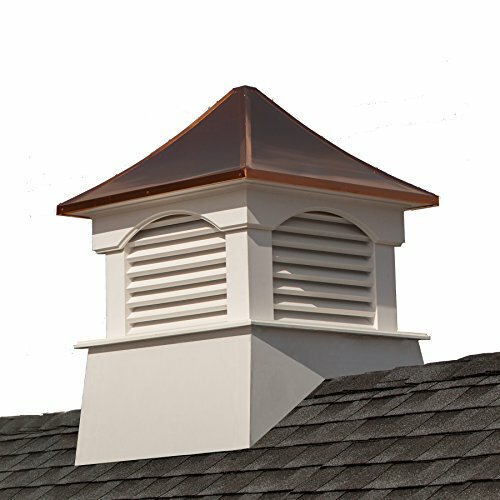 Our cupolas arrive in 3 sections for easy installation, includes assembly hardware and easy to follow detailed installation instructions, and are weathervane ready with a built in internal mounting bracket. YouTube videos are also available to walk you through the installation step by step. 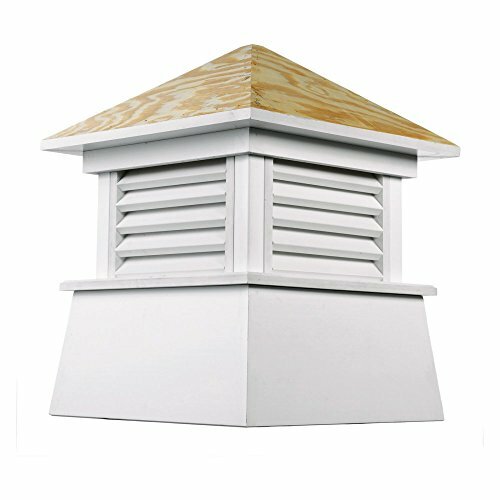 Good Directions vinyl cupolas have an industry exclusive Lifetime Warranty. For a distinctive finishing touch to your home, add a Good Directions weathervane or finial. MAINTENANCE FREE, ROT FREE, ROYAL BRAND SOLID CELLULAR PVC VINYL - expertly crafted using a CNC Router, for a precision cut every time. 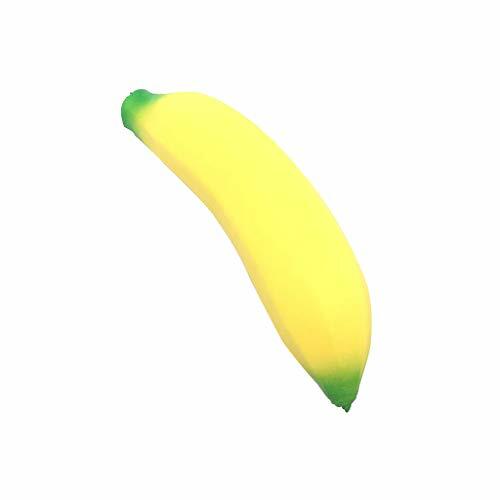 May be painted with exterior acrylic latex paint. 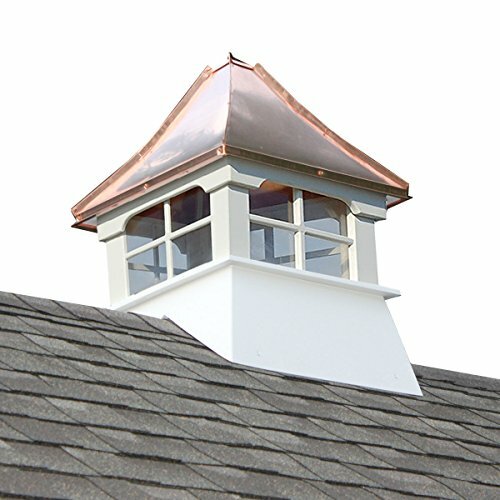 24 GAUGE PURE COPPER ROOF - Grade 1, 16 ounce pure copper roof will naturally patina over time. SUPERIOR STRENGTH - Roof has reinforced rafters. Louvered mid-section equipped with interior wood framing brace. 18 gauge Heavy Duty staples used instead of single nails to prevent components from shifting and for increased strength and durability. DIMENSIONS - Assembled: 18Sq x 24H. Square size measured at roofline. Fits up to a 10/12 pitch roof (most roofs). When calculating the size of your cupola, use our steadfast builder's rule of thumb: 1.5 inches of cupola width for every foot of unbroken roofline. See photo for more information. MADE IN THE USA - Made to Order. LIFETIME WARRANTY- Industry Exclusive Lifetime Warranty. WEATHERVANE READY - Cupola is ready to accept a Good Directions weathervane. Includes pre-installed weathervane bracket inside the roof for easy installation. SIMPLE ASSEMBLY AND EASY INSTALLATION - Comes in three sections for easy installation and delivery. Includes assembly hardware, predrilled holes and an easy-to-follow installation guide. We are happy to hear from you about any question of the items you interest and answer the questions in 24 hours. 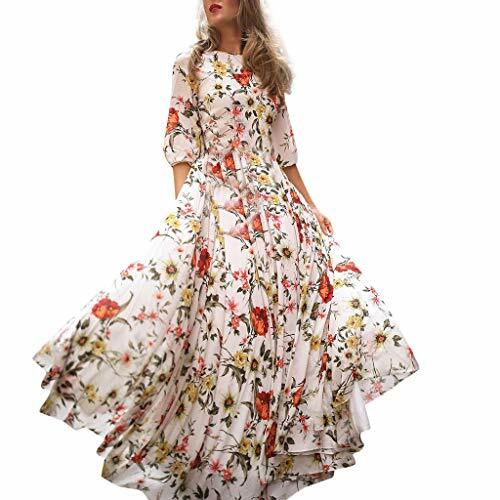 Dear buyer,our goal is to make all our customer have a happy and satisfied shopping experience.So please double check the descriptions and the measurements of the items to be sure that items will fit you or someone that you are purchasing for properly before placing your order and bid. Occasion - Womens swimsuits perfect for surfing, beach, pool, honeymoon, hawaii, summer vacation, SPA, swimming, perfect for all your water activities. It is also the best gift for your family members, friends and lover on special days or everyday. Web exclusive! Add an architectural element to your shed or gazebo with a Good Directions Kent Cupola. 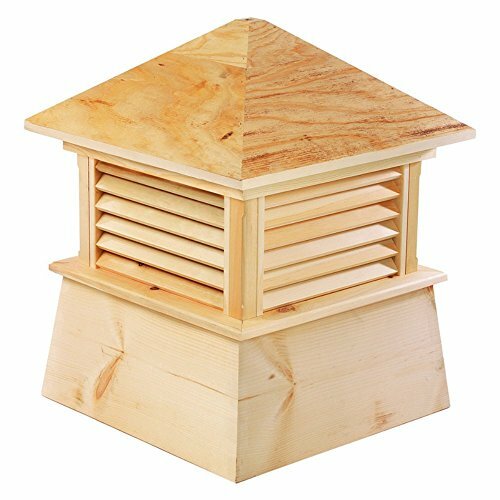 Featuring American style, its a louvered rooftop structure crafted of premium-grade cypress for lasting beauty. 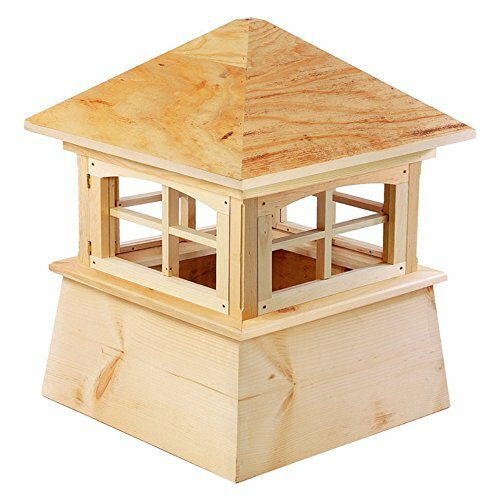 Ready for you to finish with shingles or paint and easy to install, this wooden dome adds an elegant crowning touch to buildings. Accentua's cupolas add character and visual interest to your structures such as garages, garden buildings, gazebos, pavilions and barns. Requiring only minimal assembly, they are designed and made to accent your buildings for many years. Web exclusive! Add an architectural element to your shed or gazebo with a Good Directions Vinyl Kent Cupola. Featuring American style, its a durable louvered structure for lasting beauty. Ready to finish with paint, shingles or metal and easy to install, this rooftop dome adds an elegant crowning touch to buildings. For over 35 years, Good Directions cupolas have been the perfect complement to your home, garage, shed, barn, gazebo, pool house, carriage house, horse barn, or pavilion. Our expertly crafted, made to order, Manchester louvered cupola features roof molding and reinforced interior supports for added strength. It's made to order in the USA from durable, maintenance free Royal Brand PVC vinyl, constructed with precision using a CNC Router for accuracy and a lifetime of enjoyment. The Manchester features a 16 ounce, 24 gauge copper, hip style roof that adds an architectural element of beauty and lasting value to your home. 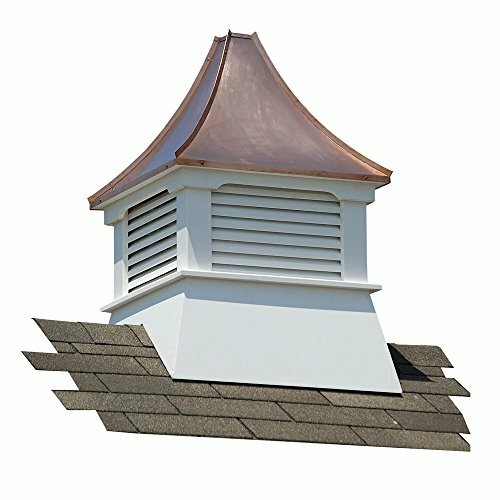 Our cupolas arrive in 3 sections for easy installation, includes assembly hardware and easy to follow detailed installation instructions, and are weathervane ready with a built in internal mounting bracket. YouTube videos are also available to walk you through the installation step by step. 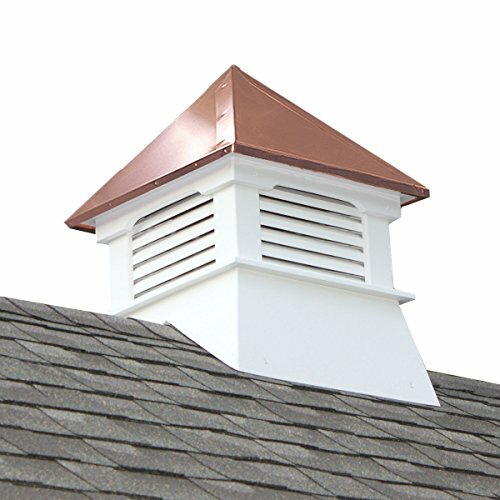 Good Directions vinyl cupolas have an industry exclusive Lifetime Warranty. For a distinctive finishing touch to your home, add a Good Directions weathervane or finial. Ships in 3 business days. The perfect size for a small shed. Complete your "weathervane ready" cupola with a perfectly fitted Good Directions "Cottage size" Weathervane. DIMENSIONS - Assembled: 18Sq x 22H. Square size measured at roofline. Fits up to a 10/12 pitch roof (most roofs). When calculating the size of your cupola, use our steadfast builder's rule of thumb: 1.5 inches of cupola width for every foot of unbroken roofline. See photo for more information. Ships in 3 business days. The perfect size for a 1 car garage or house. 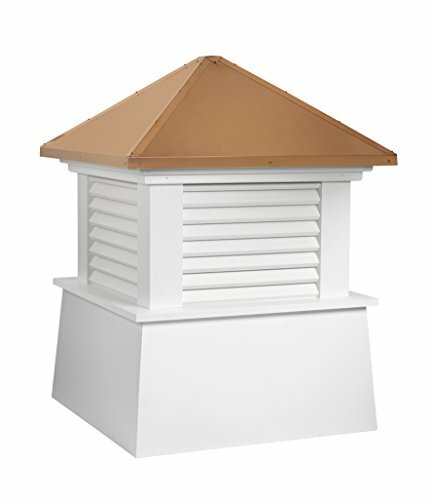 Complete your "weathervane ready" cupola with a perfectly fitted Good Directions "Standard size" Weathervane. DIMENSIONS - Assembled: 26Sq x 32H. Square size measured at roofline. Fits up to a 10/12 pitch roof (most roofs). When calculating the size of your cupola, use our steadfast builder's rule of thumb: 1.5 inches of cupola width for every foot of unbroken roofline. See photo for more information. Web exclusive! Add an architectural element to your shed or gazebo with a Good Directions Coventry Cupola. 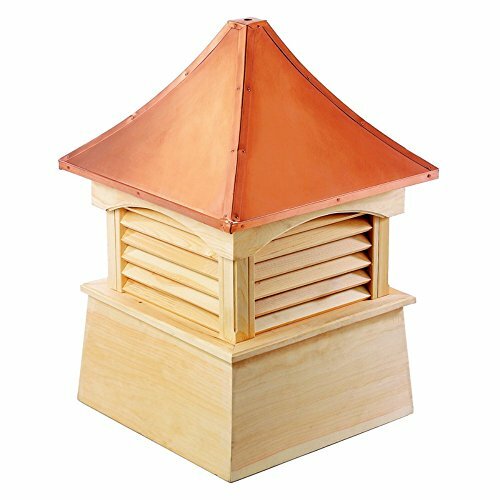 Featuring a polished copper pagoda-style roof, its a durable cypress louvered structure for lasting beauty. Ready to finish with paint or shingles and easy to install, this rooftop dome adds an elegant crowning touch to buildings. For over 35 years, Good Directions cupolas have been the perfect complement to your home, garage, shed, barn, gazebo, pool house, carriage house, horse barn, or pavilion. Our expertly crafted, made to order, Manchester louvered cupola features roof molding and reinforced interior supports for added strength. It's made to order in the USA from premium grade cypress for a lifetime of enjoyment. Wood cupolas should be painted or stained. The Manchester features a 16 ounce, 24 gauge copper, hip style roof that adds an architectural element of beauty and lasting value to your home. 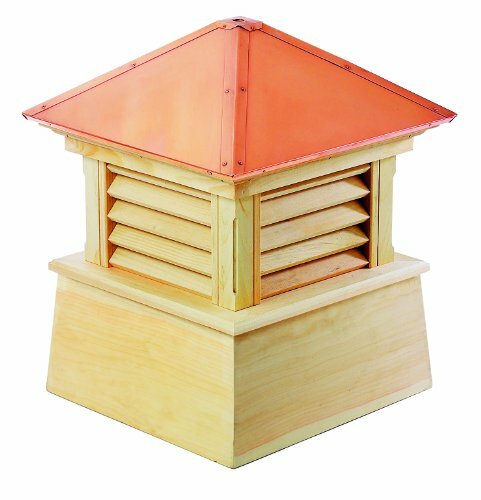 Our cupolas arrive in 3 sections for easy installation, includes assembly hardware and easy to follow detailed installation instructions, and are weathervane ready with a built in internal mounting bracket. YouTube videos are also available to walk you through the installation step by step. For a distinctive finishing touch to your home, add a Good Directions weathervane or finial. PREMIUM GRADE CYPRESS - For long lasting beauty. DIMENSIONS - Assembled: 22Sq x 27H. Square size measured at roofline. Fits up to a 10/12 pitch roof (most roofs). When calculating the size of your cupola, use our steadfast builder's rule of thumb: 1.5 inches of cupola width for every foot of unbroken roofline. See photo for more information. Give your home a classic touch with the Good Directions Brookfield Cupola. This wood cupola comes in its natural state, ready to be painted or stained while the wood roof gives you the choice to shingle it, cover it in a metal roof, or leave it as it is. Designed to fit most roofs (up to a 10.5 pitch), you'll love putting your creative skills to use to create perfect look for your shed, gazebo, or other outdoor buildings. Unsurpassed in style, quality, and durability, this cupola comes in your choice of size so you'll have not trouble finding the perfect one for your home. Good Directions got its start by creating weathervanes and cupolas, but it has expanded its line to include a wide range of decorative yet functional products for the home and garden, including popular fire domes, rain chains, and garden weathervanes. The company continues to attract innovative artists and designers eager to lend their vision to the creation of exceptional products to enhance the home, both indoors and out. No matter which way the wind blows, you can count on Good Directions to show you the way to a beautiful home. Select from available material options. Comes in 3 easy-to-install sections. Fits most roofs (up to a 10/12 pitch). Select from available size options. 1-year limited manufacturer warranty. Toys for 1 year old boys best selling prime toy storage bag toy storage box basket toy storage organizer with bins toys for 1 year old under 10 dollars toys for 1 year old boys best selling toys for 4-5 year old boys under 10 dollars toys for 4-5 year old boys dinosaur toys old boys trucks building blocks Squishy Super slow rising.